First of all, I am getting some really good information from the Medicare 101 quiz posted Sunday evening. When the responses stop coming in, I will share some of the more interesting results with you. It will certainly give us some useful information to use when writing posts in the future. As I suspected, Coumadin should be a schedule II medication controlled to the same degree as Oxycontin and other medications that shouldn’t be distributed freely due to the risk of untoward side effects up to and including death. Now, I have proof. Medscape has a new, very short CE activity that offers evidence to support my position. After reading the CE article, I am sure you will agree with me that the best way to prevent unavoidable hospitalizations is to discontinue Coumadin on all of your patients. Seriously, if I was an ambulance chasing lawyer, I wouldn’t spend money on TV commercials for my law practice. I would advertise Coumadin. If your stodgy MD’s don’t agree with my assessment, at least consider upgrading your communication processes related to Coumadin. So I guess that leaves us with good old fashioned nursing care as a solution. Consider using SBAR-C communication when communicating with others about Coumadin. Situation: I just drew lab on Ms Smith as ordered a week past her last dosage change of Coumadin. She is currently on 7.5 mg daily and her INR is now 4.2. Background: She had a mechanical valve replacement two years ago and did fine on her Coumadin until recently. Her INR’s decreased to sub-therapeutic in recent months. Her two most recent INR’s and corresponding dosage changes are: (give example). Recommendation: Do you want me to hold Coumadin for a couple of days and then restart? If so, what do you want her dosage to be? Communication: Gave above orders to JUDY, patient’s daughter who stated she was removing the Coumadin from the patient’s med planner box now and putting the bottle of Medicine on top of the refrigerator so it wouldn’t be mixed up with normal meds. Sometimes, there is nobody reliable to instruct on changes. In that case, an additional skilled nurse visit should be ordered so the nurse can go to the house and remove the Coumadin herself. Since we know that unstable Coumadin patients are going to have a lot of unanticipated lab and orders, conservative scheduling with PRN orders for medication updates should accommodate the needs of the patient without breaking your budget. Or, you can go back to my original advice and discontinue Coumadin on all of your patients but before you do that, let me explore some of the regulatory issues that may arise if you don’t follow physician orders. I seem to remember reading something about that somewhere . Years ago, I had a cardiologist that said taking coumadin for A-fib was more dangerous than the A-fib for complications. I guess he was very much ahead of his time. I don’t take it and have repeatedly refused much to my PCP’s chagrin. I’m going to share that Medscape article with him and since he has a desk in our overall department, he’ll find it on there when I go back to work. Most of my clinical background in Cardiac Intensive Care – CCU, CICU, cath lab. Patients used to get so worried about pacers, AEDs, etc. My position is that if it were my erratically beating little heart, I would go for the mechanical fix over the pharmaceutical fix every day. The last two charts that I reviewed for potential lawsuits involved coumadin. I hate coumadin. My son was diagnosed with A-Fib when he was still in his 20’s. He was admitted to ICU several times for defibrillation and heparin, but not put on coumadin at the time. He had an ablation procedure and was fine for a year and had a recurrence of A-Fib. His cardiologist put him on Coumadin after the ICU defibrillation and heparin. He went along with the program for a while, but had to go for PT/INRs weekly, increased doseage almost weekly, but his gums were bleeding, his nose was bleeding, and everytime he bumped into something, he bruised. He told his cardiologist, he was stopping the coumadin. He and the cardiologist had a “discussion” and they parted ways. My son was very aware of the risks vs benefits. The EP Physician who did the ablation told him to take aspirin, which he did and still does. He’s had no more A-Fib. He is in his 40’s now and A-Fib freeeeeee….knock on wood. As a nurse, I have seen so many disasters occur due to coumadin (AKA rat poison). At our HHA, we have a 3 person, check and re-check system. 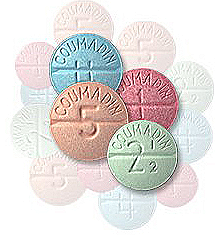 Our coumadin patients are very well documented, checked, and re-checked. We send a nurse to make adjustments to the mediset or if the patient is unsure about any changes. We have had only one coumadin related hospitalization since we started our “system” over a year ago (knock on wood.) It’s a very dangerous drug and I wish it was not so freely prescribed, but hey, who am I to say. If patients were as informed and as assertive as my son was, there may be fewer disasters that are coumadin related. Hold on just one minute!!! Do you realize that if all patients were as informed and assertive as your son, we likely wouldn’t have jobs. Just kidding. Most of my clinical background is in Intensive Care taking care of heart patients. I didn’t actually give coumadin until I was in home health. My position is rather jaded, I admit, but for the first 15 years I was a nurse, the only time I saw patients on the drug was when they had problems that required surgery (not good) or if they were non-compliant and had to be on continuous heparin for a few days after throwing a clot or something interesting like that. I probably am not qualified to make a determination if it is overly prescribed or not but I am qualified to determine that if we do not take this medication as seriously as we can, there will continue to adverse events and deaths that could have been prevented. I like the three person check and recheck system. When I was in the hospital we did the same thing with Insulin. I do not ever remember drawing up the wrong amount or seeing someone else draw up the wrong amount but the very process of double checking was a constant reminder to us of how we needed to take insulin as seriously as a heart attack (which we knew all about in the CCU).